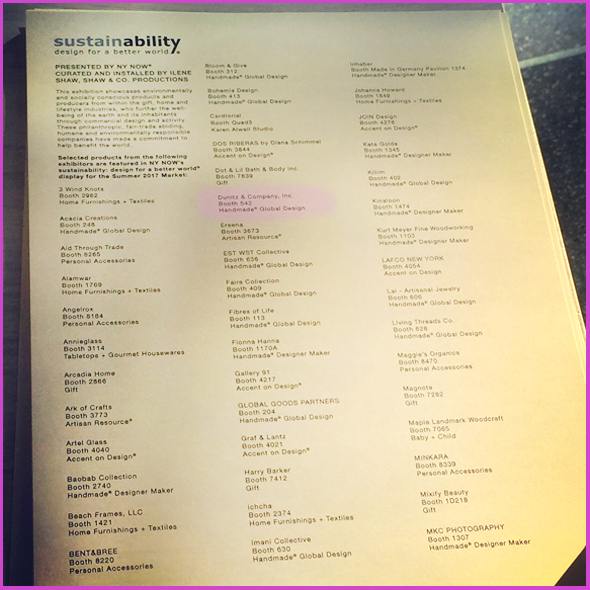 For several years now, NY NOW has highlighted environmentally-conscious and socially-responsible products and producers from around the world. 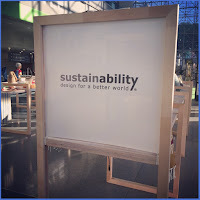 They've done this by staging a special exhibit "SustainAbility: design for a better world" which typically presents offerings from about 100 exhibitors. They take this display seriously. And it is always stunning! 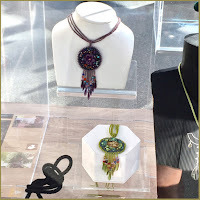 Exhibitors submit applications and with information and photos of new designs for inclusion. If chosen, there is no cost involved. And it is an honor to be chosen. Dunitz & Company fair trade jewelry has been part of this display several times. 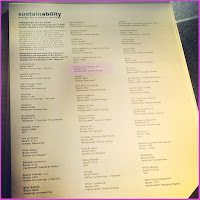 Ilene Shaw of Shaw + Co! Productions curates this exhibit and for admission considers newness and inventiveness as well as business ethics and environmental practices. Several Fair Trade Federation members were included in this display this season including some of our favorite colleagues, WorldFinds, Aid Through Trade (our friendly bead competitor) and Sustainable Threads. The information they require on our applications is not only used to evaluate the way we do business, the information is shared with attendees that actually check out the exhibit. 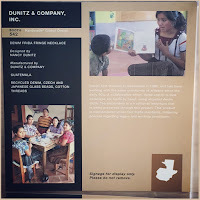 Here's the placard they prepared on Dunitz & Company. 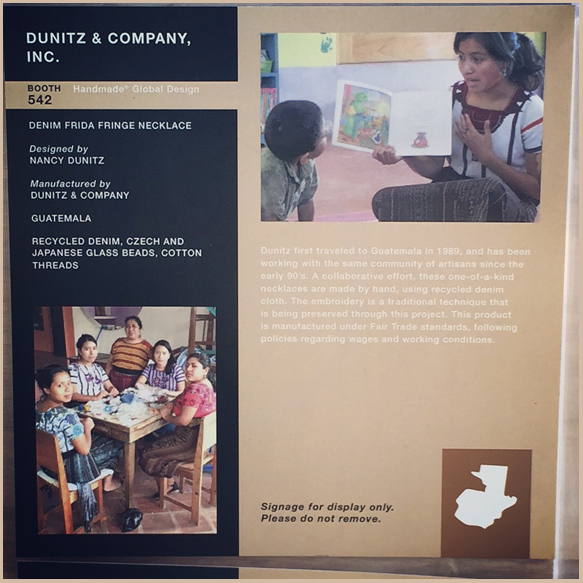 It shares information on our business and the fair trade necklace design we had on display, photos of some of our artisans and an organization we support, Puerta Abierta (free library) in the town where our beading artisans live. This season, two of our Denim Frida Necklaces were featured. Yes. Yes. Two is always better than one. We offer these wonderful embroidered (on recycled denim) adornments in several colors. 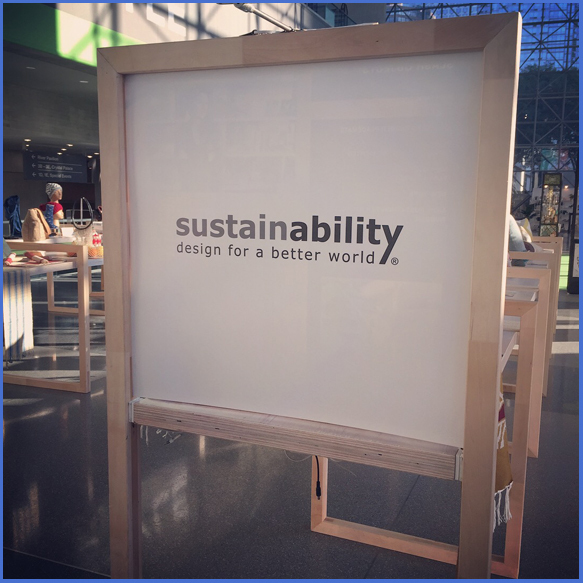 We wanted to be certain that those perusing the Sustainability display would know these necklaces were available in more than one color. Fair Trade Education...at the show!